Dallying In The Dirt, Issue #233--- There is a pretty pink weed growing in my walkway. Any large and diverse family will always have an Uncle Charlie that no one wants to invite to the party. Plant families are no different. The genus Euphorbia is just such a diverse family. We all know and enjoy Euphorbia pulcherrima which we grow at Christmas time and call Poinsettia. There are any number of large succulents, similar to Cactus but mostly native to the old world. Then there is what I call pink weed, growing in my pathways and fighting for space with my creeping thyme ground cover. Spotted spurge Euphorbia maculata is what the books call it. It is an annual with a deep but thin tap root that produces lots of seeds that happily overwinter to start up again next spring. If it didn’t invade spaces so readily it is actually a rather attractive plant. 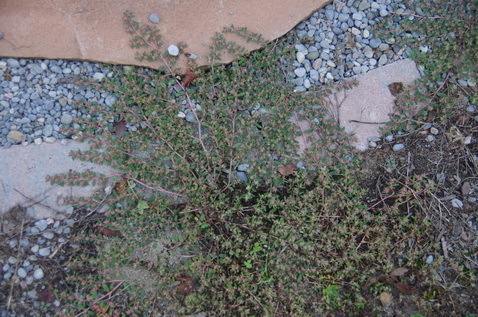 Its little green leaves, each with a red dot and its bright pink stems all growing in a very neat and orderly pattern do have some visual appeal, until they cover the gravel walkways and suppress my thyme covered paths. I admire it each time I bend down to remove it. I try to make sure that I get as much of the tap root as possible, as it will readily regrow from that root. The one joy in pulling this weed, is the amount of ground you may clear by removing a single plant. Yes, I know it’s Tuesday , but I’m trying to get my life organized. I’m leaving tomorrow, for a week, to attend my annual Garden Writer’s symposium in sunny Pasadena. After I finish “Dallying” I have to provide the Assistant Gardener with instructions about what chores she might undertake in my absence. I think she is secretly hoping for a hard frost that would eliminate most of the containers and their regular need for water. “Dallying will reappear, hopefully, next week with pictures and stories from the gardens we visit. There is a magnificent crop of Eggplant in the garden and I have very subtly left a few recipes for Eggplant lasagna on the kitchen counter. Staying with the weed theme, here is another batch of weeds that I actually planted this year. That was not my intention but rather the result of some of my poorer horticultural practices. The picture shows one of my new Iris plants surrounded by a lush growth of fresh weeds. How did that happen? I always try to amend the soil with some of my compost when I plant new perennials. If I was more efficient at maintaining the gardens then I would not find myself pulling out weeds that are large enough to have mature seeds and then throwing them in the compost pile. A really great compost pile would get hot enough to kill weed seeds but I don’t think that actually happens in anyone’s backyard compost. It’s better to never let weeds go to seed but that would be in an ideal world, not in mine. The Iris enjoy the enriched soil enough to make the extra weeding worthwhile. Bright bold colours start to disappear from the garden at this time of year but there are a few exceptions. One of them is a very poorly named perennial. Obedient plant Physostegia virginiana is anything but. It does have long spikes of bright pink/purple blooms that really stand out in the garden but you can see that they don’t necessarily stand up. This plant is in full sun so it’s not wandering around looking for light it’s just lazy and wants to lay down for a rest. We understand each other, since I’m obviously too lazy, I like to think that I’m too busy, to stake it up so that it can make a better show. It has one other significant feature that defies the “obedient” name. It wants to take over the garden. Each year, I attack it and pull out at least half of the plant in an attempt to make it be obedient and stay within its designated confines. It is a member of the mint family so that should give you a clue about its ability to spread. There are supposed to be new varieties that have been bred to be more well behaved. I’ll have to go and look for them because its colour and bloom time do make it a desirable plant to have in the perennial garden. If the weather cools a bit, by the time I get back home those other bright pink/purple blooms, the Colchicum, should be bursting out of the soil and it is one plant that is welcome to spread as much as it’s capable of, in my autumn garden. Rasheed Asks? I planted a blue berry plant last year in partial shade and want to it to a full sun location. What is the best time to transplant it, there weren't any blueberries this year. Ken Answers! 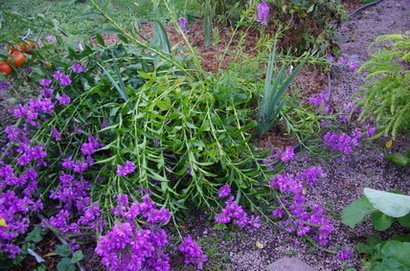 You could move it in the next week or so as soon as the weather cools down and the plant's leaves start to turn colour. Blueberries need two different varieties in the same garden to cross pollinate or you won't likely get any fruit. Valerie Ask? 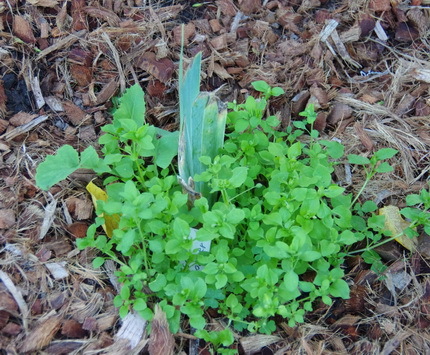 When is the best or right time to put mulch around plants - Spring or Fall? Ken Answers! I don't think there is a best time. It depends on your objectives. If part of your mulching is to provide winter protection then obviously the fall is better. I apply mulch when I'm ready for it. When I have removed all?? of the weeds from a bed and have finished planting any new perennials then I mulch as soon as I get the time to do so and hopefully before any new weeds have started to grow. It tends to be a mid summer job.